Arthur Neervoort van de Poll was born in Amsterdam on April 22, 1891 to a wealthy and for the city and its national 'Rijksmuseum,' significant family. For the city because the Van de Polls had sometimes been mayors and sheriffs, for the museum because of a bequest and a loan of both old and modern art (1). His parents were Jacobus Rudolph Hendrik Neervoort van de Poll and Marthe Jeanne Elsine Geertruida Philippine Zubli, who celebrated their wedding in 1887 by minting a medal, which can be found in the collection of the Teylersmuseum in Haarlem (2). His father had not been born as a legitimate child and was initially known as 'Neervoort' only, but by special permission of the King, following not long after the bequest to the Rijksmuseum, he was allowed to add 'Van de Poll' to his surname, though not with the nobility attached to legitimate members of the family (3). What he did have, was a large inheritance with which he collected insects and modern art, while being vice-president of Artis, the zoo in Amsterdam. One can find his photographic portrait and notes about his butterflies and ants collection on a website with biographies in German of 'the entomologists of the world:' Poll, Jacob R.H. van de Neervoort. His collection of 'modern paintings' went on loan to the Rijksmuseum and then on sale at an auction in 1921, the catalogue of which holds black and white images of paintings that art historians these days do not call 'modern' any more, having reserved that term now for paintings from 1912 (4). In it are many works by the Maris family like Doornroosje (Sleeping beauty) by Matthijs Maris, which painting is presently named - I suppose wrongly so - De spinster in the collection of a rich Rotterdam merchant, which was turned into the Kröller-Müller Museum (5). A few years later, in 1924, father Van de Poll is said to have died in Monaco, the place that his son Arthur would use as a home away from Jeddah. Father Neervoort van de Poll, who went on expeditions abroad collecting species and enlisted other's to send him new species of animals and insects or objects of ethnography, somehow became passionate about all things Japanese (6). A passion art and design historians call 'Japonism.' Neervoort van de Poll joined that spirit and modelled a building in a Japanese pagode style on his estate in Rijsenburg for his butterfly and ants collection and had the gardens layed out with Japanese elements. A picture of its lake with father rowing a boat and his three children standing around it can be seen by linking below a master thesis about Dutch estate landscaping (7). It didn't stop at that. The Algemeen Handelsblad of June 3, 1928 reporting about 'A museum for Asian art in Venice,' the Museo Orientale Marco Polo, makes a reference to the 'Japanese museum Neervoort van de Poll,' which no longer existed and got dispersed all over the Netherlands. There is hardly a trace of the museum left, but it must be the same as a Japanese Museum which existed next to the Zoo and the Ethnographic Museum in Amsterdam from at least 1880 to 1885 (8). During a visit of two Queens, Emma and her daughter Wilhelmina, in 1895 the former Japanese Museum is said to have already disappeared and turned into the new monkeyhouse (9). The interest for Japan had a business side to it also. There is an echo of that which affects our story perhaps directly. In the sense that it may be a clue to how Arthur van de Poll got into a position in Jeddah. In a bankruptcy case as late as 1926 of both person and company of W.A. van Veen a list of creditors is published. By far the largest creditor is Artur Neervoort van de Poll in Jeddah, while another large creditor is the still undivided inheritance of his father (10). It suggests a long term family relationship with this firm which traded with the far East. Throughout the latter part of the 19th century the Van Veen company operated shops in several cities in the Netherlands selling Chinese tea, while in Amsterdam, on a prestigious location opposite the stock exchange, the firm from the 1890's on concentrated on the import of Japanese art and artifacts, being a prolific advertiser for them in Dutch papers around 1910. It is easy to see how this relationship may have provided the network from which the job in Djeddah became available. Arthur had an older brother and a younger sister. Hendrik Jacobus Neervoort van de Poll (1889), born only two years before Arthur, also left Amsterdam in 1911 and lived for some time as a colonial trader and investment manager in Medan on the island of Sumatra and in Djakarta. The following well illustrated list of passengers leaving Amsterdam for Indonesia includes his name. The brother returned to Amsterdam, married first the daughter of the Japanese goods importer, and in second matrimony a Swiss lady, with who he had children and settled in Lausanne, Switzerland, which might explain why Arthur van de Poll at the end of his life was living in Switzerland too. 1) His grandfather's bequest to the Rijksmuseum included portraits like that of Holland's luitenant-admiral Swartenhont (1566-1627) by Nicolaes Elias. Pickenoy and - probably - his wife Elisabth Bas, at the time attributed to Rembrandt, but now to Ferdinand Bol. 2) Huwelijk Neervoort van de Poll en Zubli op Teylersmuseum.nl. 3) 'Herengracht 476 Huis de Vicq' on a website about Amsterdam canal houses, where as the source for the namechange is given a royal order of December 11, 1880. Retrieved October 17, 2017. But his (grand)father's publicized request can be read in the Provinciale Noordbrabantsche en 's Hertogenbossche courant of November 6, 1879: Neervoort van de Poll. 4) Moderne Schilderijen - Verzameling Neervoort van de Poll, auction catalogue by Frederik Muller & Co., Amsterdam 1921. 5) Now named De spinster and in the collection of the Kröller-Müller Museum in Otterloo since 1959, according to the RKDiamges website: Matthijs Maris, De spinster. And to be seen in colour on that museum's website: De spinster, 1873. 7) Elyze Agnes Charles Smeets, Landscape and Society in Twente & Utrecht, a geography of Dutch country estates, circa 1800-1950, The University of Leeds School of Geography (2005). A master thesis published online by the University of Groningen. On page 183 a photo of the Neervoort van de Poll family in the gardens at Beukenstein, with presumably Arthur and his brother with their father and sister. 8) 'Stadsnieuws,' Het nieuws van den dag, November 11, 1885. 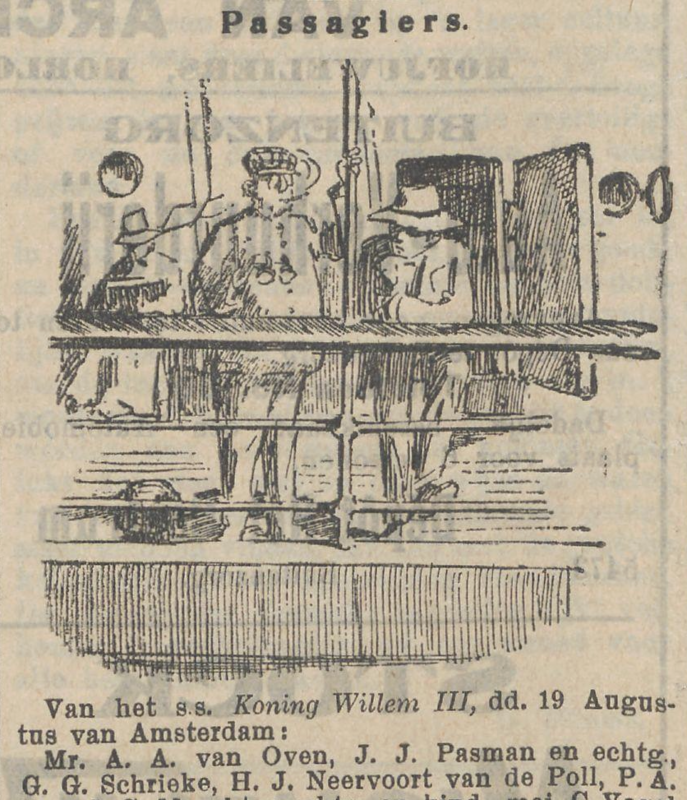 9) 'Brieven uit de hoofdstad,' in the Leeuwarder Courant of August 26, 1895. 10) 4) 'Failissementen, opgave van crediteurenlijsten,' De Gooi- en Eemlander, December 16, 1926. Of the total outstanding debt of Dutch guilders f 225,947.59 Arthur Neervoort van de Poll is owed f 91.529.63 and the second largest creditor, the estate of his father f 10,500.51.